Fletcher International Exports (FIE) Logistics division moves in excess of 18,000 Twenty foot Equivalent Unit (TEU) per annum. The division supports its own logistics and shipping centre, where staff have extensive experience in dealing with shipping lines, Governing Bodies and freight forwarders in making import and export of freight in shipping containers seamless. 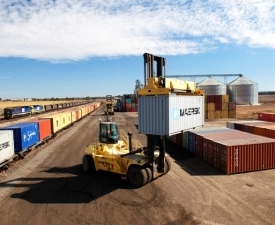 The intermodal terminal supports a variety of products including abattoir products, mining exports, cement imports, fertilizer imports, grains, pulses, cotton lint and cottonseed, with room to expand into new products. FIE Logistics division manages the entire task from port to depot for imports and depot to port for exports, through a variety of contractors and our own rolling stock. No container job is too big or small. The division prides itself on using a strong relationship network to leverage better value for customers on shipping, trucking and rail rates to ensure our customers have the most competitive options available. We promote open communication ensuring transparency and consistency right across the supply chain when meeting customer’s expectations. 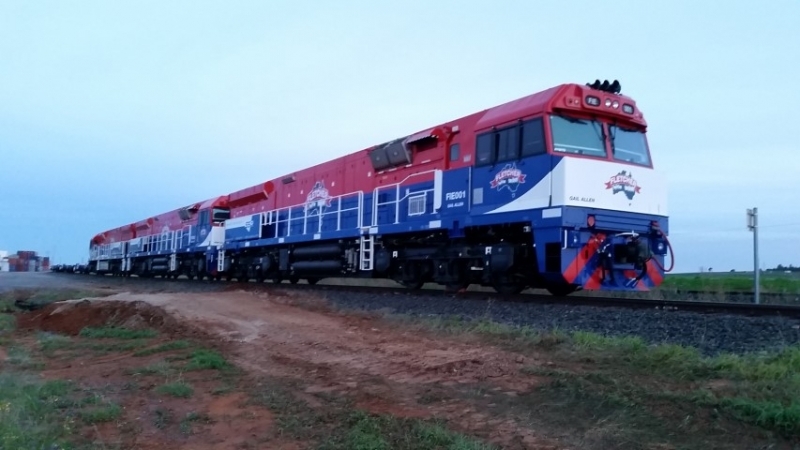 FIE currently owns the longest and heaviest container export train in Australia. 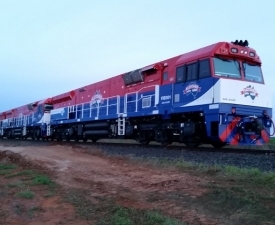 Fleet size of 3 x C44aci UGL 4500 horsepower locomotives, 62 x 60 foot CIMC wagons with a combined length of 1.28km. Our train is proudly operated by Southern Shorthaul Railroad (SSR) with extensive train management experience. Currently we have a train capacity of up to 5,000mt trailing tonnage, 186 TEU slots per service, up to three times per week. With the ability to run extra services. Train unloading and reloading is carried out efficiently by two heavy Hyster forklifts, one Hyster reach stacker, and one 10 tonne Toyota container handler. When on site our train stables on our private 1.5km double ended loop siding, with over 700 metres of hard stand train loading area. 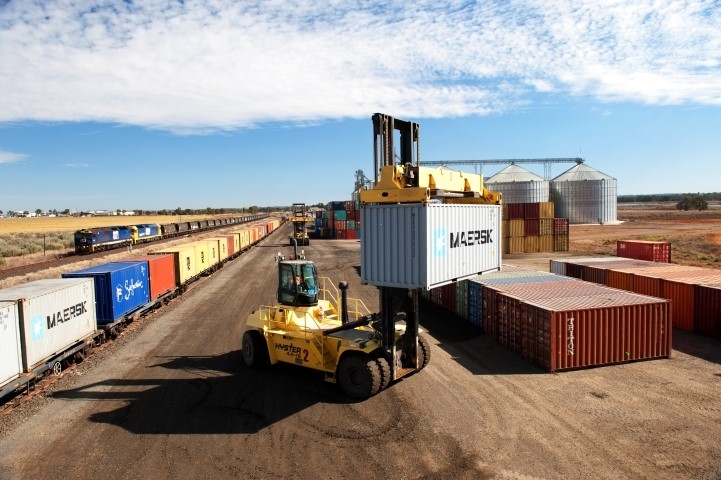 Our train calls all three ports when in Port Botany Sydney – DP World, Patricks and Hutchison, then collects our empty containers from MCS Cooks River for the return journey to Dubbo. Our site has road train access, with two road train weigh bridge’s, open 7am – 4.30pm Monday to Friday, 52 weeks per year. Railing Port Botany to Dubbo (Round Trip from MCS Cooks River or One way from Cooks River). Twenty and forty foot containers, empty or up to 32mt gross. We can arrange tailgating in Port Botany of our customers import containers as well as ocean freight shipping management, transport from intermodal terminal Dubbo to customer depot, unpacking of containers, warehousing of product in Dubbo for packing and export. Recently commissioned cement powder blending and packing plant, providing tailored mixtures to customers requiring large volumes of cement products, currently importing approx. 30,000t of cement and aggregate products annually. Importing and distributing fertiliser to producers strengthening a mutually beneficial relationship. Currently importing 5,000t of fertiliser annually with growing demand. Decommissioned shipping containers are available for sale.